We have just experienced the most powerful Spring Equinox that has ever occurred within GAIA. Not only was it intense during the acceleration, but preceding the event could be life changing depending upon your own pathway. We have spent the last three months preparing for these energies with high activations occurring continually with the moon cycles and other planetary conjunctions. It prepared us to receive the highest frequency that was possible for each individual. Every lightworker on the planet was taken to a new level of their consciousness whether they were fully aware of the changes or not. The Spring Equinox was unique as it made us look within ourselves to see what needed to be changed in order to receive the next level of awareness. The timelines are being ignited from our Etheric body to help us move along the process as we become mutli-dimensional beings. This is a challenge within itself as it is affecting us through the four body system so it can become one body of light. So now we have arrived at a new juncture in our pathways. It is time to reflect on where we were before, what we experienced during the transition, and allow the transformation to fully take place. We are being asked by Spirit to remember our humble beginnings and allow those essences to be embodied within us. The challenges are great so if you are having a difficult time of assimilating what is occurring, you are not alone. It depends upon the level of healing that an individual is processing within themselves and how honest they can be of their own ability to get into the depths of their soul’s history. A lightworker that is newly awakened may feel quite overwhelmed with the challenges that they are facing and it takes a strong commitment to fully stay on this pathway. It is taking us deeper into the depths of our souls and the challenges never stop. They will continue as long as we strive to be the best we can be. The Ascended Masters within the Brotherhood of White Light have been conveying these energies to us for a very long time. They want to assist us in this process, but they cannot totally understand as no species has ever acquired this level of acceleration in a group consciousness. Each of us individually is on many levels within the initiations, and it is a different experience for everyone depending upon our consciousness, life situation, and the contract we signed up for previous to our incarnation. Some may feel the need to catch up whereas others may feel they are tired of all they are going through. I urge you to keep trekking onwards and upwards. There is great responsibility to step into this pathway, but it is a rewarding job when you communicate with the Higher Beings as they talk with great emotion to the work that you have done. Our time is coming to be with each of them in Oneness on the New Earth but we have a lot to do in the meantime. This earth is not ready and will not be for quite some time. So we have to be challenged in order to shower the way with our Light and Love quotient in order for the One’s that are following us that will be able to accomplish it in an easy and swift manner. We have to live in-between worlds of Duality and Oneness. It is part of the plan so that we can remember one day the journey that we took and how successful it was for everyone involved. This is why this Equinox was so very powerful. We must hold as much light as we can in order to assist GAIA in her acceleration along with the humans that just might be ready to wake up. GAIA is readying herself to merge with Terra Christa, her male counterpart, and we are assisting in this transformation. If we can think of our challenges in this manner of assisting her, then isn’t it all worth it? Look how much we have changed as a species. Yes, we still have a long road ahead of us but it is much smoother than it was just 5, 10, or 25 years ago. So what is our next step in this process of acceleration on Earth? It represents balancing the opposing energies. Reflect back one month ago and the challenges that you encountered during the month. How did you get through them and would you do anything differently? What tools do you use that truly assisted you? These elements are creating our foundation of our new reality. We will be going through highs and lows continually through 2013 so we need to reflect each time to help our lower minds accept the higher thought processes that are occurring. On Wednesday, March 27, 2013 we experience a full moon cycle at 2:27 AM, Pacific, 9:27 AM GMT. This moon represents opposing forces of Libra within Aires. Libra represents compromise and Aries represents taking care of the Self. So now we put into practice what we have learned in the last cycle of acceleration by creating balance and being in the flow. 2013 represents Synchronization, and now we are being tested to allow the light to guide us through the uneasy areas ~ Being in the Flow. Take time on this day to create the balance you need with GAIA’s energy. Walk the ground, feel the energies around you, listen to the birds, and feel the wind whistling in the trees. In order to feel the movement, we need to continually do the walk no matter what we are encountering along the way. Join us for a powerful call on Wednesday, March 27th at 5 PM Pacific. Details are listed on our website, http://walkingterrachrista.com/tele-calls/. We have just gone through a tremendous change in consciousness from the higher realms into the Earthplane levels. The Spring Equinox was better received than we had hoped. We believe it had to do with the lack of exposure within the media and not centered upon the doomsday effect as what occurred on December 21st, 2013. This not only means about the changes but incorporating them within the consciousness of the planet. Spring is always a very beautiful time of the year as the blooms will start showing from the ground; but that is not the question here. We want to say that within the planet as a huge consciousness the energies were well received. In the Southern Hemisphere they are moving into the Fall Equinox which still represents growth and abundance. So it does not matter where you stand within the world, you are being affected greatly by the changes that are occurring. Change is inevitable at this time and it depends upon your own ability to know thyself and how deep you are willing to travel to find the beauty of your soul’s history to be awakened into your consciousness. This truly brings it to a point of reference. Those that are not as challenged as some are definitely not willing to understand the process of what mastery may mean for them. They may not even know they are on a mastery pathway but have come into this world with great gifts which they term as having mastery. Not so, my Dear Ones. If you as a Lightworker are utilizing powerful gifts into this world but yet do not know who your Higher Self is, not willing to go into the depths of healing to be a better person, or are willing to find balance within your Feminine and Masculine Divine, then you are on the wrong side. You are tapping into timelines when you were quite gifted in a world that did not perform on the Universal Laws. Many of the extra-terrestrial communities out of the Galactic Whole have been gifted with these abilities, but they are not working in harmony of the One. We share this knowledge because many individuals are waiting for their lives to get better. And that’s what they will do is – wait and wait and wait. Mastery represents responsibility and gifts are not given to an initiate, they are earned deeply and honestly. So we ask you? How did you feel about this equinox? Did you feel the pressure of wanting to change, awakening with dreams that seemed very unreal, and then feeling it within your physical body? I am sure most of you experience this; possibly not every day but periodically. It is because your Etheric body is healing so deeply and wanting to merge within the physical essence. It cannot do so until the debris is removed of the old karmic ties that need to be acknowledged and healed. This is true mastery ~ allowing the essence that you were to become who you are now and then knowing that the merge cannot be achieved without the removal of the energies that do not fit presently. We ask you again ~ How did you feel this Equinox? If you felt happy, go lucky and ready for spring to blossom or autumn to effect change, then we say to you, you are not ready yet for the change. We bring this information forward not to judge as everyone has free will. But those that want to be more, must aspire to the highest mountain that they can climb. We share these energies as a lesson in awareness. Learning what you are experiencing, how you can get through them easily and effortlessly, and seeing the progress happening within you is the best advice we can give at this time. This equinox brought many emotions to the surface along with the thought forms associated within the emotions. The Masculine and Feminine traits are coming more into balance. The power of these energies was created upon the Earth to awaken individuals into the aspects that do not fit who they are presently. So it is a personal experience in what is to be awakened. The more you learn about your Soul’s Purpose and Essence, the more you can reject or accept into your awareness. The timelines of the past and future crossed simultaneously to create the present to be balanced within each person that was ready to go deeper into themselves. Presently, the challenge is to balance these elements that were brought to the Light. Aspects that were not accepted readily need to put into Wholeness as they do not fit an individual’s Highest Purpose within their pathway. Remember, this is different for each soul embodied upon the Earth and there are no judgments of an individual’s pathway good or bad. 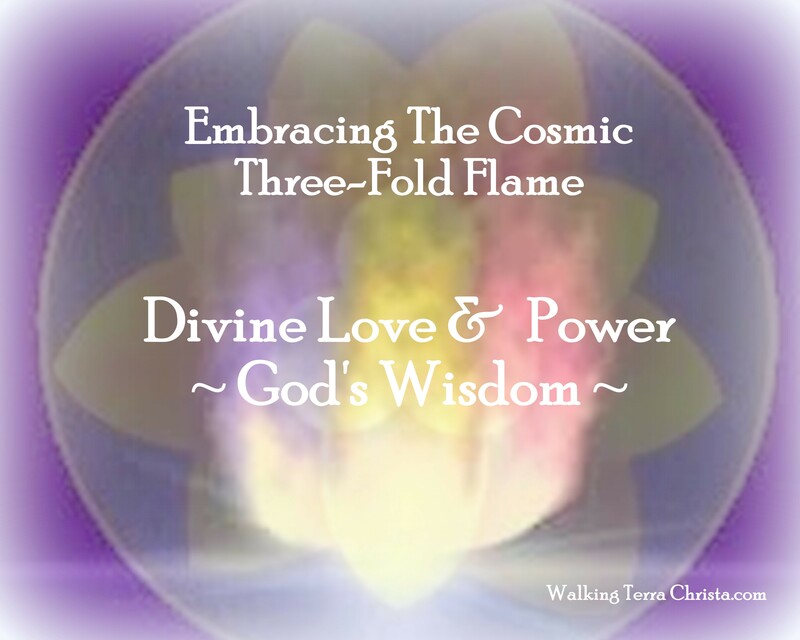 Our purpose in these updates is to share how a person that chooses the Mastery Pathway can best help themselves to move further to create the Divine Love, Power and Wisdom of the Three-Fold Flame. It is the choice of each Lightworker to stay within their present circumstances or to go deeper within their initiation levels. Our goal is to assist everyone in understanding this process and just because you are a Lightworker does not mean you desire to walk in Mastery. Initiates can stop and stay within a certain level while being very content and happy. Learning to be an ascended master is a long pathway and only the strong can survive. So in essence what we are saying is that this equinox represented these changes to occur. In order to walk into the 5th dimension on a physical basis, you must decide to be on the Mastery Pathway. You can be attuned in a consciousness level but it does not mean you will be able to create your Body of Light with the Three-Fold Flame activated. Our desire is to have every One of YOU to step into this role and that is why we bring this message in such a direct manner on this day. There is no time to waste. The physical existence of your 5th dimensional self is awaiting you to be acknowledged. Yes, we are intense because the time has come to get down and dirty within yourself. Look within and understand what fits and what does not fit for you. We have the power to do MORE with one another. We reach out our hands to each of you – but you must acknowledge your Self Worth by sharing your Light and Dark essence with us. We will help you get there, but you must acknowledge what aligns in Wholeness and what will be rejected within that frequency. There is more to come. This Equinox was the first of many accelerations for this year. The next frequency to be prepared for is the Lunar Eclipse on April 25th which will represent expressing the Light to shine in the darkest areas of the Soul. We express to you that it will take you deeper into the depths of your essence to learn who you are, what you are to create, how to find the aspects that stop you, and bringing wholeness to your existence upon this Earth. So it seems we have a lot of work to do with each other. Each of us in the Unified Whole Command had to go through the same process of admitting what we have done in the past may not serve the Greater Whole. The equinox was just the beginning, but you are not on this journey alone. Every human being is going through this same process no matter what level they are existing within their initiation and ascension process. It is going to get more challenging the more you resist – it will persist. So that brings us to this week. We have laid down all the rules and what can happen if you do not do it. But what about the other side of the coin. What will occur by accepting to be more of yourself? Well, accessing your Higher Self and I AM Presence is essential on a daily basis and many moments within that day. They are going to assist you in feeling their energies physically and you will be able to flow through the day even if it becomes a challenging one to endure. Laugh at yourself, smile deeply, and know that this is just a testing period. You are the maker of your destiny with your Higher Self and I AM Presence. You cannot do it without them. This is the first element you need to realize and then go deeper by allowing the changes to happen within you. Learn from your dream state and meditations what you need to do next. You have these abilities. We would not be speaking to you if we did not. It is our time to shine together and we so look forward to see the transformative process within each of you. We are standing by for your approval for us to work with you. Ask for the Unified Whole Command and we will greatly assist you in learning how to be in Oneness within yourself first within your dream-state and then with meditations. Please Share with Others ~ Many Blessings for a powerful Spring Equinox ! I fall into the abyss. Into the depths of my Soul. To be fully accepted within me. Now are fully in command. I must allow the old to be removed. Within this Being I Am. Are guiding me into the perfect moment. Guide me into a new reality of Light. In the Light of the Christ I AM. The Divine Being I AM. Come fully into the Union I AM. Now intertwines within the Pink and the Blue Flames. Of the Cosmic Three-Fold Flame. ©2013 Walking Terra Christa, Rev. Christine Meleriessee & Mike Hayden, 5th Dimensional Mastery ~ All Rights Reserved. No use without prior written permission allowed except for sharing the post in its entirety along with the link to this page; http://walkingterrachrista.com/2013/03/19/decree-spring-equinox/. We have just moved through another New Moon, on the 11th which brought more frequency of light with the Rainbow of Lights Dispensation (video: http://www.youtube.com/watch?v=J1xlgeRZS2o). The Elders Surrounding the Throne of Grace are bringing into GAIA more light vibrations through the 12 Rays of God. This is occurring each new month but this month is especially powerful as we move towards the Spring Equinox of the 20th. The Christed energies are once again pouring down into the planet to assist GAIA in her acceleration. What happens to each of us that are inhabiting the lands at this time? This all depends upon your own awareness and how deep you are willing to go to experience more of your highest essence as it was in the beginning of our Creation. The Mastery Pathway may not be for every individual person, but upon awakening into an existence that allows for higher knowledge to be accepted within the physical mind, each soul will step into this way of being. Every lightworker is on the mastery pathway even if they do not categorize themselves as doing so. It depends on how our Higher Self will create the planning and execute it through the physical self. Understanding this pathway helps each individual as to the why and wherefores of what they have been experiencing in their life recently. We cannot deny it, the planet is changing drastically and in order for each of us to accelerate with her, we need to purge and destroy the elements within us that no longer can exist within a Body of Light. This week has taken us to new levels of removing these particles that we do not like to admit that we have within us. We are at the last week before the Spring Equinox, and the Spiritual Masters such as Lord Adama, the High Priest of Telos, has expressed that in order to truly receive the Christ Consciousness as our Higher Self and I AM Presence is offering to us, we must remove the elements of debris that are keeping us from pure joy, harmony, and creation of a blissful life. It is deep as the Etheric body is the Soul’s body in between lifetimes and holds all these energies in its livelihood. So we are clearing on the multi-dimensional levels that have existed for us in many lifetimes over and over again. Each of us wants the creation of the 5th dimensional energies within our physical body, but are you willing to go to the depths of your soul, your Etheric Body to be purged of the old timelines so that you can actually feel the acceptance of your essence from the Heavenly Realms? Well, this is what is occurring presently and we are all going through it with each other. I have been on this pathway for almost 30 years, and I am still removing elements that I thought were gone. They are coming from timelines in my Etheric Body that have similar feelings as this lifetime that have already been healed and integrated with higher levels of existence. Each of us is going through these elements; and we all know, it is not fun. Our dream states are cluttered and full of uneasy emotions which can come into us when we awaken. What we do with them is the most important element to understand. Then, there are those that do not awaken with the lower emotions but yet feel so very tired and dizzy through the day. This is when the Mental body is so strong that the emotions cannot be removed. Don’t hold unto anything this week or from this point forward. If it feels uncomfortable remove it with the Rays of God specifically through the Violet and Pink Flames. Utilize cleansing techniques with Sage, sprays, breathwork, and chanting higher vibrations within your body. You no longer have to hold onto these thoughts or emotions that come plaguing into your consciousness. It is our Divine Right to be the Spiritual Minds and Hearts that we are. We are directly associated with the Divine Mother and Father God. Allow their essence to be your essence as we learn so much more about ourselves through this process. It is an exciting time but it is also a very intense time. The next surge of creation from the Christ Consciousness will be enfolding within our planet on the 20th of March at 11:02 GMT. This upsurge of frequency will stay with us for a three-day period, and it is up to each of us to fully ground the energies within us. If we don’t prepare ourselves through this process, we will experience the effect of being in a tornado and spinning with the energies as it moves through areas that can accept or reject it. The more individuals that can hold it deeply within their Earth Star and into GAIA, the better it will be received. This past tri-mester has been intense for everyone. It is our duty as Lightworkers to expand ourselves and know that inside of us, we also have dark spots that need to be reflected with the light. You don’t have to know everything, just ask for your special Spiritual Master to help you through the process. The Ray Chohans are standing by to assist humanity and by commanding their energies to be with you, IT WILL BE DONE. v Accepting the Christ Consciousness of the Gold, Lord Maitreya, Lady Pallas Athena, Archangel Mazuirel. Wishing you a fabulous experience for the Spring Equinox of 2013. It is our divine pleasure to step forward once again and share the energies within the essence of the One. This is a powerful weekend that is occurring and more changes will be happen within each of you. The planet is at a very crucial point as GAIA is truly feeling the changes while elements in her aura shift and adjust to the new paradigm of light that is enfolding. We understand that there are massive amounts of frequencies that each of you are feeling. You probably do not comprehend it as a frequency but it represents the Light and Love quotient of each individual arising into a new level of awareness. As your body becomes more accustomed to receiving the higher vibration, it will accept this light exchange within areas of the body that are ready to accept the fluidness of the energies. You may not realize what is and what is not in the Receiving Mode. If you have a quick check of your physical body and the related chakras, notice a calmness and the ability to feel in balance within the areas that are accepting the energies. As you work through your chakra system, it is important to realize that there are specific areas which still need additional work. When your chakras are in complete alignment with one another (especially upon awakening), you should feel the sensation of serenity and peacefulness within your thoughts, emotions, and physical body. Take an inventory of your own system. Someone that has been on the pathway of mastery for many years usually has the ability to understand where they are in the standing of their chakras and physical body. When the feelings shift into a lower frequency, it usually means that the Etheric body is cleansing the many timelines that are pocketed within this area and is being emitted through the physical sensations. Sometimes an initiate will not be able to tell if it is from this lifetime or others timelines that are being activated. Don’t worry about when it happened. Just utilize the flame energies of the rays to assist you become more aligned with your Spiritual essence by allowing your Higher Self to be fully in command. It is a time in which the physical self is surrendering unto the higher self. This is why it can be challenging as the lower mind and heart is not used to having another essence to come into physicality. It is a process that is ongoing with the acceleration of allowing your Higher Self to activate the higher vibrational energies within your four-body system. Take some moments and reflect the energies within each of your chakras. Allow them to spin in a clockwise manner and notice any abnormalities as you do the exercise. It is important to feel the flow of the chakra as this is a sign whether there may be an imbalance or an adjustment that needs to be made. If you can sense that it is flowing well, and the physical area around the chakra feels vibrant, then that particular chakra is in alignment with the four-body system (Physical, Etheric, Emotional, and Mental) so that that Spiritual body can be fully activated and accessed. Your body is going through major challenges to accept the renewal of the Self to be activated within your consciousness so your four-body system is becoming more aligned along with your three-minds become one Universal Consciousness through the Higher Self and I AM Presence. Take a moment a reflect these changes you are going through presently. GAIA is experiencing the same symptoms through her bodily structure. When each of you align within yourself, you are helping her to do the same. You have chosen to come unto the planet at this time to be of assistance, but yet in the process your lower self can become very strong and not want to release the old elements. Part of the reason is that as a human being we do not want to acknowledge that we have done bad things to others. But we are in a time when everything must come into Oneness, and it cannot be achieved without removing the outer layers that have served you previously but now must be destroyed with the Light that you are. This is an explanation of this trimester in a very short version. Each of you have given your oath to do as much as you can to surrender to the new energies and allow the old ones to surface to be put into Wholeness. Up to the Spring Equinox this is becoming stronger as the intensity of the Light and Dark is merging to allow the Oneness to occur. In the meantime the shadows of the dark have been lurking to try and steer you away from the total light or to think that you are in the light which truly is not fully activated in its highest purpose. It is the illusion that is being created by your world so that you do not fully move forward at this time. THE MORE INITIATES THAT ARRISE TO THEMSELVES, THE MORE LIGHT WILL BE ENCASED WITHIN GAIA. We cannot stress this enough. The power of these energies presently is beyond any of our comprehension as it has not happened before. You cannot sit by idly waiting for the 5th dimension to appear in your world. You must acquire it within yourself. Gaia is not nearly ready to accept her 5th dimensional body but she is moving closer just as each of you are. Stop fighting the system and find your own way of Being. Allow your Higher Self to guide you into the next phase of the Christed Beings Upon this Earth so that you can be that beacon. The beacon of light will not shine just be saying I love you and I am the Light. Take an internal inventory now if there is nothing else that you do before the onset of the Spiritual Equinox. We wanted to share about the Rays of God and the Chohans so that every individual person that sees this script can take the responsibility within themselves to be a Master for the New Earth. Ask you guides how you can assist yourself deeply. They will show you and then you will be ready. This activation of the Christed Beings will allow these changes to occur and change you will see within yourself. But not until you become very honest with yourself, look within, and ask for assistance to be more than you ever thought that you could be. We honor you, walk with you, and accept you as a Divine Being of Light. We thank you for accepting your own truth through the essence of Divine Mother and Father God. We are One as we walk together into the New Earth. ©2013 Walking Terra Christa, Rev. Christine Meleriessee & Mike Hayden, 5th Dimensional Mastery ~ All Rights Reserved. No use without prior written permission allowed except for sharing the post in its entirety along with the link to this page; http://walkingterrachrista.com/2013/03/15/new-earth-frequency-update/. This has been a whirlwind of a week and as promised by many of the Masters, through our teachings that this is just the beginning. March is truly proving to us that what needs to be removed and stripped away from our present consciousness will be done presently. As we are moving towards the Spring Equinox it is being shown to be another state of creation within our existence. If you look at the planetary structure, we are preparing to take what we learned from the Full Moon in February to fully change our way of living concerning our inner self. It is a perfect time to take inventory of what is not working so that we can accept the new changes that are about to occur for us. This takes quite a bit of inner reflection and not every individual has the capability to do so without proper training. Learning how to be our own best critique is very important especially during this month. Elements are arising within and around us to help us move into a more defined pathway of light whatever stage of growth you may be experiencing. Every time there is an interaction with another individual we must look at ourselves. Our mirror images are much stronger than they ever have been before to make us look deeper within ourselves. Communicating with others right now can be a dialogue with our inner self as having a reaction towards another individual will trigger something within ourselves that needs to be addressed. Many individuals do not realize this and since we are in the world of timelines being crossed to be realized, this is exactly what is occurring. We are learning how to have balance within our lives and until we can do so in each moment, these elements are going to appear for us to address. This also takes us into the energy of Mercury Retrograde which means that what does not serve our Highest Purpose needs to be changed and rectified. So the old elements of the past are arising for each of us to become more integrated and allowing the Oneness of the Self to emerge. It definitely is not easy but the Universe is helping us to acquire the ability to totally reflect within so the outer reflect can illuminate to others around us. The power of these energies is unbelievable as we look at what has happened this week in the world of finance. Changes are going to happen and we must learn to look deeply so that we can adjust to the world around us every day. So we cannot be lazy and slack backwards into an existence that no longer serves our reality which is changing each moment. The movements and the power of the energies presently is beyond our ability to measure them except in our personal experience of the Self. This is going to mold the balance that is necessary on our planet as GAIA is shifting with each of us. The New Moon energies arrive on March 11th which brings in the Feminine Divine more closely in alignment once again. It is here to prepare us for the Spring Equinox of the 20th which will be the 2nd phase of the Christ Consciousness being imbued upon the planet. We cannot deny that we have not been in the preparation phase in the last three months. The power of the energies is beyond our comprehension so, yes, we will bring more to our reality from the heavens of light. And, no, the world is not ending in the way we thought it would. But it is a new beginning. It is a time to reflect within ourselves “where our endings lie so the new beginnings can manifest”. We cannot sit idly by and allow the changes to happen to us but move through our own changes. This will assist us to transform with the tides of movement and create our new reality of Light. Take a moment on the 11th to allow the Rainbow of Lights (Video: Rainbow of Lights Dispensation) to enfold within your being as the Elders Surround the Throne of Grace bring another surge of colors-within-colors activating the Rays of God physical upon Gaia. Then take time to ground the frequencies for the Spring Equinox and then the full moon cycle at the end of the month, March 27th, 2013. It should be another surge of powerful energies arising within the next 10 days. We are all in a very magnificent time of growth. As we watch each of you experiencing life in a different way of being than you ever have before, it is a moment of pure reflection of the times when we shared with each of you in a different manner. We speak not only as the mentors that you have followed but as the colleagues of Light as you truly are doing the walk for many Light Beings of the Universe. We have watched and waited to see the fruit of your efforts become the purity of your Hearts and Desires. We have walked with you as you prayed for the healing of your souls to be of more assistance to this Earth. We watched you as entered this plane of existence, we call Earth, from the moment of your birth time and time and time again. You returned with newfound knowledge of your humanly existence but wanted to be able to interject more of your spiritual essence. So you returned time again to re-learn the lessons and apply them to your present existence to re-write the karmic debts so then you would be able to accept your essence within a higher dimensional state. You are tired, and want to see the truth be revealed upon the planes of GAIA. You want to know that the end is in sight and how much more can you endure without having the ability of flying high and experience the essence of a Divine Being Manifest upon a planet that was thought to pure in the depths of darkness. We are at a most crucial time of history within the structure of the many Universes as part of what you want will be realized very soon, but it is a long journey to transform a planet from complete darkness into one that is fully realized into the Hierarchy of Light. When you chose to be here in this time frame, you knew how long it would take and that the journey could be long and arduous. But, yet, you probably have forgotten those moments of our discussion. You want to believe that it is all going to change immediately and the ascension process is NOW. Well, in retrospect, it is NOW but what are you doing for yourself to make it an easier pathway of transition? This is exactly what you are experiencing presently. Wherever your truth lies in these moments, it needs to go deeper into your belief system. You must acknowledge yourself as a Supreme Being of Light, but there cannot be any lower thoughts interfering with this process of your Divinity being fully created in a humanly way of life. It is time NOW to understand that the conditioning within your mind and body needs to be readjusted to accept the new way of existence. This is what is occurring within this month of March within this year of 2013. The energies of duality are being actualized within every living function essence of this planet. You have arrived to do a job but yet you are probably not fully prepared to do it in the way as you have been taught in the Schools of Learning within the Spiritual Hierarchy. There is still more training that needs to be done and wherever you are on your journey, this is not the end of it all in bliss and harmony. BUT IT CAN BE. The frequencies of Light that are coming into the planet presently are allowing for this awareness to be unleashed into each human being that wants to accept it. What is occurring presently is the battle of duality is still at hand to make sure that some will lose and some will win. But we do not take that statement lightly. WE WANT ALL TO WIN. There is no other way for us presently as we acknowledge the depth of our souls within your souls. What you acquire within yourself is a direct response of the work we have done with you and it is not done yet, but must be actualized within a higher state of existence. The power of your ability to make these changes is within you, but you must acknowledge the parts of yourself that are lost and forgotten. What needs to be remembered is that you are a Sovereign Being of Light lost in the midst of karmic timelines, and it is time for a new being to emerge out of your midst. It is time to fully embrace the Light that You Are, but you must realize the sacrifices that come with this pathway. Just admitting the mistakes you have made and the people you may have hurt along the way will help to adjust all the other elements that need to come in place. Your gifts are awaiting and they are not wrapped within your Lower Ego. They are being given to you through your Higher Self and I AM Presence to be unleashed when you are ready to accept them fully. Everything that you have been feeling, the physical changes, emotional challenges, and the thoughts permeating within you that need to be purged are due to these alliances of the past trying to make you Lose but yet in the end you will WIN…Why, because we have your back. You are the leaders, the ones that will walk into the New Earth but the time is not yet. The journey is just beginning; we want you to know that there is still so much more to accomplish. So when you allow the energies of the Feminine Divine to fully come into your being once again for the Spring Equinox, accept them. Don’t question why you need to flow from one moment to the next and allow the old thoughts to be gone completely through the process. Don’t fight the body when it needs to rest or eat as the higher vibration is assisting by your mental mind of the Masculine Self is your detriment if it is not aligned with God’s Will. His Will does not want you to suffer or be in pain. You have done enough of that to yourself in the past. Now is the time to allow the Will of God to be your Will of Light. Embrace it deeply and see how you can make the necessary changes in your growth process. This is what we are experiencing presently upon the planet. You will want to deny that the beauty is not coming but the more you allow yourself to flow into it, the more you will accept your Destiny of Light. This time before the Spring Equinox is very crucial in allowing the duality to not exist within you and accept the presence of your heart expanding into the power of your Light. Expand it, embrace it, and allow it to flow. Feel it move through you. Fight it and the fight will get stronger. We embrace you for taking this challenge of the walk into the New Earth. You are not alone as we share your joys and your pain. Let us rise together in the ecstasy of the moment as we knew it to be long ago. Do what is necessary to help yourself in the process. That is all we ask ~ to embrace your Divine Self as you create this walk upon the New Earth. You are the pioneers of Light showing others the way. It is the chain-within-chain of Light that we are together. In Oneness That We Are. ! ©2013 Walking Terra Christa, Rev. Christine Meleriessee & Mike Hayden, 5th Dimensional Mastery ~ All Rights Reserved. 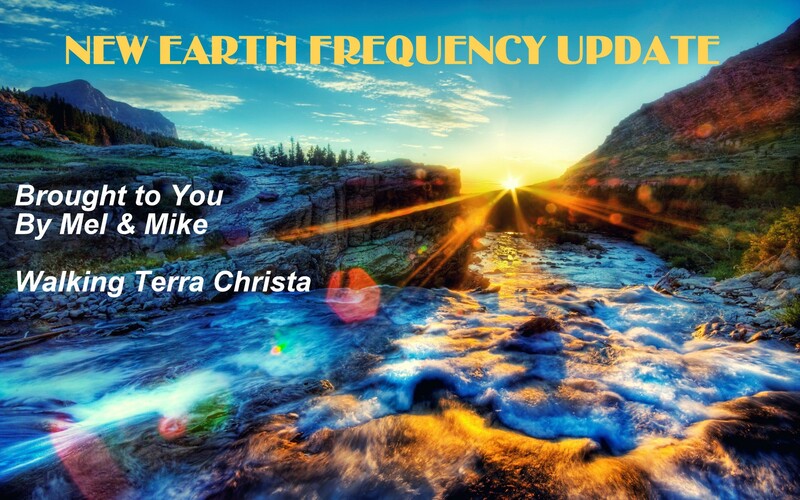 No use without prior written permission allowed except for sharing the post in its entirety along with the link to this page; http://walkingterrachrista.com/2013/03/09-New-Earth-Frequency-Update. We are in an age when many of us are stepping out of the 3rd dimensional arena to walk into our existence of Divine Beings upon this planet learning how to create and prosper in a completely different way of existence. This takes great courage and patience upon the Mental and Emotional levels to stay strong when we are consistently hit with old programming that arises into our consciousness. We are now in the midst of the third month of the first trimester in 2013 which is a challenge within itself. The energies are very dualistic which represents the 4th dimension. We constantly have to strive to reach the higher energies in order to have balance within our lives. This is true for everyone on this planet as it becomes a challenge to stay above the old thoughts and feelings that previously were our “way of being”. That is no longer the case. I do not care if you are very abundant in one phase of your life at this time; we are all being asked to become more of “who we are” in each moment. So an individual that has a lifestyle that creates funds for themselves and their family may not even realize that they are being challenged, but believe me, they are. Where are they in their relationships of the self and their family? Do they feel secure within themselves about every thought that they have? I guarantee you that they do not. They are probably living in the 3rd dimensional world of working within the many corporations or doing ‘what they think is right’ and are being gifted with having a paycheck each week that says, ‘you did a great job’. But the truth of the matter is that these individuals have not had the chance to connect within their own soul’s essence and find the beauty that is within them. We’ve all been there. Some of us have stepped out of that world and found their true passion in life. We are in a time when every individual on this planet will be looking at themselves and asking ‘what else can I do to feel better or live in a more beautiful way’. It cannot be helped. So what happens in living abundantly? There are many categories that are within the word ‘abundant’. It represents how we feel about our lives, our joy, our living arrangements, our ability to travel with monies and not be worried, to know that the bills are paid each month, and to share with others when our Heart desires it to be. Abundance represents these aspects and many more elements depending upon each person’s reality of life. When you walk out of the 3rd dimensional arena into a world that you desire, sometimes the energies need to catch up to where you exist in your conscious reality. There have been many individuals that feel in order to be prosperous you have to be buying items that are highly priced and paying for services that show “I AM ABUNDANT AND I CAN PAY FOR THIS SERVICE”. Then there are those that have a hard time paying their bills and just living from day-to-day. There has also been criticism towards individuals in the healing modalities that they should not charge or they do not charge enough. Our society has been based on the value of the dollar and not the service. We have strayed away from Universal Laws of Balance within the Cause and Effect that in order to receive, we must give. Some individuals take too much and others give too much. How to we create the equilibrium between both? I pose these questions because each of us is being challenged to create that balance within our lives. We are moving into the 5th dimensional level of consciousness but we still have some time to acquire that experience in our lives upon the planet. Many of us stepping into the unknown world from the 3rd dimension are experiencing it greatly. We are the ones that are working on our Emotional and Mental attitudes; and sharing with others how to do the same. It takes time to transition from one world into the other and that is what each of us is experiencing presently. We know that the Poverty Consciousness has been part of our past timelines. The individuals that are flowing with their funds presently have created this experience for themselves. Many times it is because they are doing “what they love” and the Universe is supporting them. What about other aspects in their lives? Then there are individuals that are truly hurting financially and then those, like us at Walking Terra Christa, have a tendency to create what we need right in the 11th hour. Shouldn’t we have abundance in all area of our lives and co-create with each other? Yes, Yes, Yes…It is time to understand why we have this innate ability to want to suffer. It is not because we truly desire it, but it has been within us for eons of time. That is what the old timelines are representing to each of us. What are you experiencing at this time? Look at all levels within the physical, emotional, mental, and spiritual bodies. Make a choice to be abundant in all levels so that you can be whole and balanced as it is intended to be. This is our prosperity circle in which we will travel to the 144th dimension to connect with our Higher Self, I AM Presence, and guidance that is assisting us. 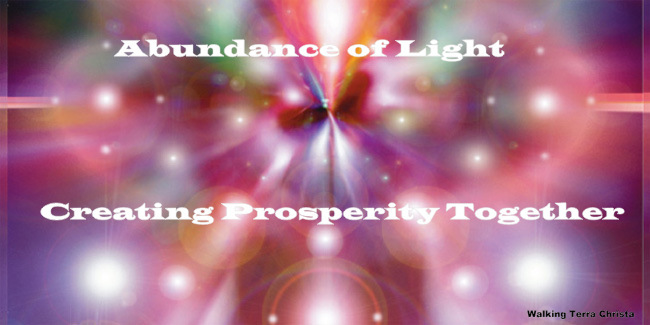 We will utilize ascension prayers, a Huna Prayer to attract money and funds, a special decree for activating our I AM Presence along with a guided meditation receiving a special blessing from one of the Ascended Beings of Light. We will be meeting Saturday’s at 10 AM Pacific, 6 PM GMT for 30 minutes of powerful affirmation of our Light within ourselves. Isn’t it time that we all flourish together in all phases of our lives? The power of group consciousness is now available for each of us. This is a Service of Light provided by Mel and Mike of Walking Terra Christa – All that is required is that you join us. We need your Light! For more details of how to join this weekly call, please see Prosperity Circle at Walking Terra Christa.